Today is the last 3 of the 12 blog planner printables that I have created and they are for blog finance. The first printable is for blog expense. This will help you keep track of any blog expenses like domain, hosting, photo hosting etc. The second will help you keep track of any income from sponsors, affiliates etc. and the last printable, will help you record any sponsor/ advertising you have on your blog. So those are the last three and now I thought I would just recap the previous printables. I hope that you found the blog planner series helpful and on Friday, I will be showing you how I organise my blog planner using these printables. Blog Planner Printables – Part 1, Part 2 and Part 3. P.S. It’s my birthday tomorrow. I’ll be leaving my twenties and entering my thirties. Looking forward to seeing where my thirties take me. These are GREAT! And I love the color scheme you used. Wow! 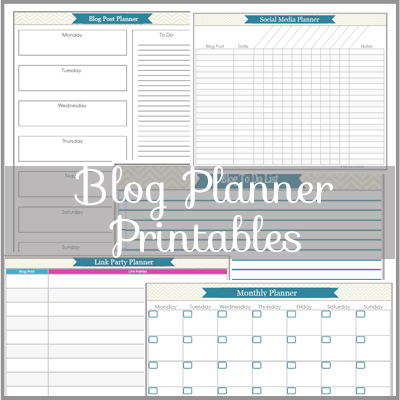 These blog planner printables are great! Tonight is my first night hosting a linky party at redflycreations(dot)com! The linky party goes live at 10 EST/ 9 Central. I would love to have you link up these printables. Thank you so much for sharing all your wonderful creative ideas! I love these printables! Thank you so, so much for sharing them. I've been looking for ages for simple, easy to use blog planning pages that have everything I need. I'm so glad to have found these via Pinterest. 🙂 Thanks again for sharing! Wow. These printables are awesome. Just perfect for my needs. 🙂 I've looked all over the place for simple, easy to use planners and Im so glad I found these via Pinterest. 🙂 Thank you so, so much for sharing! Ooooh, these REALLY appeal to the organising nerd in me! Thankyou so much for sharing. I'm planning a post on my blog in the next couple of weeks to share excellent resources for fellow bloggers. I'll defo be including a link to this! Have a whole bunch of planner pages printed off already. Was just about to do an excel spreadsheet….you've saved me a helluva lot of work so THANKS! These are really fantastic, I can't thank you enough! I've begun my own blogging journey and this is just what I need to organize my 'all over the place' brain right now! Can't wait to share a post when my binder is up and running! Thank you so much for sharing – I recently started my own blog and have been looking for something to help keep me organized. I think this will work wonderfully. Thanks again! you're the best!!! thanks so much for this! Thank you so much for sharing these, they are just what I've been looking for! Love it! SO helpful! I was JUST about to purchase a set of printables for my blog and thought I'd check out some other places to find something free instead. Found your page on Pinterest and so glad I did. Thank you so much for sharing! These look great! I shall be popping back for these. Thank you for sharing.